Samurai: Displays battery level, heart rate, month and day of the week dials, and a seconds dial. It also digitally displays total daily steps and a digital time display. The font has a bit of a 1920s feel to it. 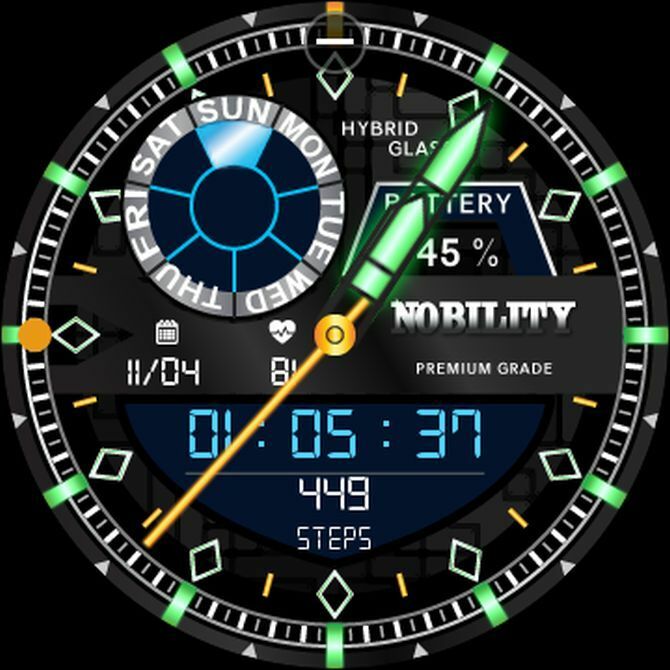 Nobility: A more colorful watch face that provides time in both analog and digital format. It displays battery level, steps, current day, heart rate, and the date in digital format. Royalty: This is definitely the classiest of the lot. It displays both battery and heart rate, plus current hour and day in analog format. The month shows as a number on top of a really cool animated gears dial. MikhailStyle watch faces are so cool that they deserve two mentions in this list. If a futuristic look is what you like, then any of these are a great choice. 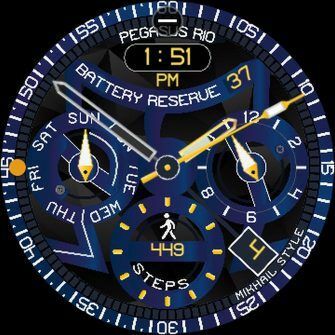 Pegasus Rio: This blue-themed watch face has a bit of a Charlie and the Chocolate Factory feel to it. Words are curved and both the month and battery level digital displays are angled. The time displays in both analog and digital. Razer: This watch face is like having several in one, because you can double-tap on it to change the color theme. Like most other MikhailStyle watch faces, time is in analog and digital format. It displays steps and heart rate. Hour and weekday are analog dials. The background is steampunk-inspired, just like the many steampunk video games available. Vortex: This is another animated watch face with a laser design that crawls across the face every few seconds. It’s a simpler setup, with time displayed in analog and digital. The top of the face shows battery level, current weekday, and date in digital format.